Sometimes I think we should change the name of our site to Dominican Cake and Other Recipes. A good percentage of the people who come to our site do it because they are searching for this recipe, this recipe generates more questions than any other, and it’s the one that seems to give most people the most trouble. I have my theories. Judging from my experience and many years answering questions on this site, a good deal of these questions could be answered if people read the recipe and accompanying post carefully. Of course the vast majority of people seem to get things right; the percentage of people with catastrophic results is a small minority of those who read and try the recipes. The problem often lies in faulty equipment, stale or wrong ingredients, small mistakes (like opening the oven to check on the cake before is done). To try to answer as many questions as possible I kept adding to the original recipe, but the Law of Unintended Consequences struck again; with more text to read some people just skipped the “unimportant” parts. Before you think I am immune to this, let me tell you: I have made the same mistakes many times. Some recipes require little thinking, reading and preparation. You would have to be an incredibly lousy cook to mess them up, and at worst the result might still be edible. Some recipes are not like that. Baking requires precision and sticking to the recipe as if it were law. Only advanced bakers can change things with an idea of what the result will be. Cooking may be an art, but baking is a science. My worst mistake was a combination of every mistake I warn would-be bakers about. A few years ago I got the cookbook How to Be a Domestic Goddess as a gift from Aunt Ilana. In it I found my favorite dessert in the whole wide world: Crème brûlée. I was very excited and eager to try it. I went as far as spending nearly a hundred dollars at a cookery shop in Santo Domingo to get my hands on a torch. And to debut my first masterpiece I decided to make it for my in-laws’ welcome dinner. Do I need to say what a mistake that was? I am not exactly sure what went wrong. One of my theories is that the Dominican eggs I used were of significantly-different size than the ones Nigella used. Perhaps the sugar was not the same (did she use beet sugar? I used cane sugar), was it my skipping that teaspoon of orange flower water? Did I read everything carefully enough? Did I skip a step? Whatever it was it seemed unimportant at the time, but the result could not have been more disastrous. That lumpy, stiff concoction was far from the rich, smooth, sophisticated dessert that I yearned for, and with which I wanted to treat my gourmand in-laws. I wanted to curl myself up into a ball on the kitchen floor and cry. So learn from my mistakes dear readers. Do not prepare an unfamiliar recipe – especially not a complicated one – when you have guests if you have never cooked it successfully before. Read recipes carefully, then read again. Make sure that you follow the recipe to a T (unless you are an experienced cook or baker). Pastry Cream Recipe for Dominican Cake: a delicious, grown-up filling for the delicious Dominican cake. 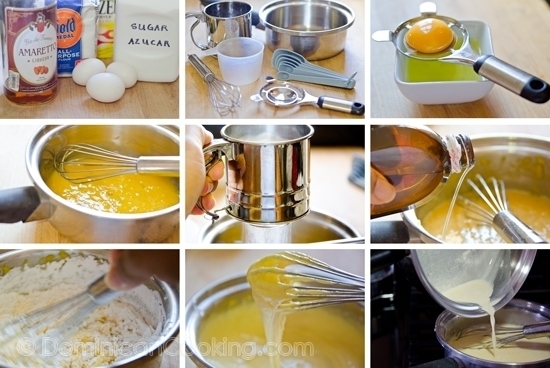 In a heavy saucepan mix the yolks and sugar mixing without beating (to avoid producing bubbles). Mix in the vanilla extract. In a separate bowl, sift the flour and cornstarch together and add to the yolks, mix well without beating, again, careful not to make bubbles. Boil the milk. When the milk comes to a boil remove from the fire. Immediately pour the milk, very slowly, into the yolk mixture, mixing well without beating (bubble thing again). Boil this mixture over low heat and stir constantly but slowly (bubbles!) until the cream thickens (like greek yogurt). Remove from the heat and pour into a glass bowl. Add the amaretto and mix well. Keep stirring until it reaches room temperature. Use as filling for your Dominican cake. This cake has a simple decoration, the texture I made with this tool and I covered it with sugar confetti. For the almond “flavoring”…is almond extract ok? And if so, should I still use 2 tablespoons? Yes, almond extract is fine. There should be no different with different sugars. And I am at a loss on why it doesn’t work for you, I have tested this several times. el azucar es regular o en polvo? lo hice pero no me salio muy bien. This recipe for the pastry cream sounds divine! I had yummy delish scrumptious Dominican Cake overload this weekend at two parties, and tonight I'm trying my hand at it, because I CANNOT get the memory of the flavor out of my head!…. I'm going to try your recipe. I couldn't help when you said your story about the creme brulee, because that has absolutely happened to me! The problem with the creme brulee was that it was over baked. When any custard is being baked, it goes through a liquid, then beautifully creamy, then curdle stage! I hope you tried again, if you haven't, you definitely should because Creme Brulee is deelicious! Every oven is different, but with custards, the lower, the better! Also, make sure that you have a water bath, that should help. And thank you for your recipes! Oh, I did in the end get it. Unfortunately not from Nigella's recipe but from my father in law's (a chef). I have yet to find out what went wrong with that recipe, and since I didn't have any more need for it I never tried it again. For the record, Nigella is an awesome cookbook writer and I never had any trouble with her other recipes. I have to accept that it is very well possible that it was I who messed it up.